"No Black and White in the Blue..."
Last year, scouring the main show floor room at NYC’s Comic Con felt like quite the task. DC and Marvel had the biggest booths with Lego smack right in the middle of the two comic giants. Doctor Who paraphernalia was in abundance. Gaming company giants were there too showcasing new games and playable demos, and everything dazzled the senses. Nintendo was there promoting Paper Mario: Sticker Star. And Square Enix also had a sizable booth. It was there along with the Final Fantasy 25th Anniversary chocobos and moogles, I saw it. 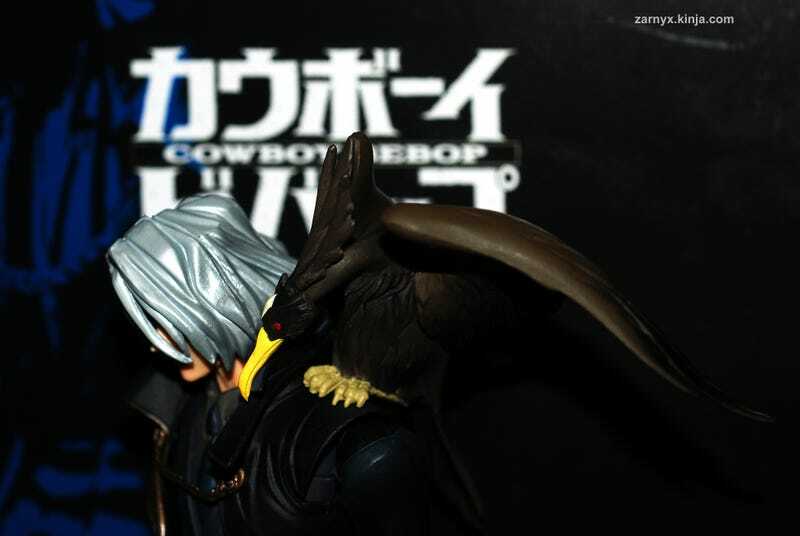 Perched on his shoulder, the ominous black bird stared at me in a familiar fashion and I had to have him... while his glare invoked images of shattered stained glass windows that glistened in my mind and a favourite song began running through my head. Released in 1998 and even after all these years, Cowboy Bebop has resonated with me in ways expressed by so many others that adding my voice to the fray serves only to praise what an amazing journey it was. In 2071, will there be space gates, junk ships and bounty hunting between planets? Will our current notions of the dark, black, and ever expansive reaches of space be littered with neon signs advertising the most useless junk? I often say of the series that it is one that is required viewing not just by anime enthusiasts but by anyone who enjoys classic literature, visual art and film. But there’s the aspect that can never be overlooked in the soundtrack which added layers to an already dense, fun, and complex cast of characters inhabiting brilliant stories. Far reaching, awe-inspiring and a wonder to behold, much like the stars and the stretch of blue sky; the soundtrack was one that embodied everything special about the anime. Sometimes, it can feel as though some shows have a stellar opening theme and a soundtrack that is just there to accompany whatever pictures moved before your eyes. Those pieces act as a pleasant background experience to enjoy in the moment but nothing more. They can be forgettable. But that was never the case with Cowboy Bebop’s soundtrack by Yoko Kanno. Not only did it have an iconic opening theme but the entire score felt very much alive and its own entity. It can stand alone, yes. But of course, it’s one that after the fact, will have you in tears from the memories of certain events in the anime. It’s one that will make you laugh and bring a smile to your face at other instances. Jazz infused, but blending so many other styles as well including spaghetti western, rock, pop, and soul for a rich, diverse listening experience; every track is crafted expertly. The songs match the situations perfectly - from scenes of a deal gone awry at a colourful space casino to a tearful farewell under an orange glow blazed magnificently across the sky - the music could feel smooth, stylish, and it had heart and soul. There’s weight in every chord of every track and power in its execution. Each song helped enhance the scene in which it was played and in fact, breathed life into every action packed adrenaline rush. Other times, the smoky sounds of the vocals and lyrics on other songs gave that unique noir feel that Cowboy Bebop so beautifully captured. Those particular songs invoked a sense of brooding, somber beauty and often gut-wrenching emotions. Other times, piano keys dance and tickle at red strings of the heart, while the bass and brass sections can unlock deep thoughts running frantically in the mind. The electric guitars excite and the saxophone sets a tone as an alluring focus for a great piece of literature, with a mysterious flair waiting to be unraveled and explored. The soundtrack is not without its silly moments but it’s those silly moments that accurately portray some of the lighter-hearted characterizations of some of the scenes and a few of characters. Child like and fun, it’s these moments that make you forget that within all the darkness that awaits, there were moments to breathe and enjoy the other aspects that Cowboy Bebop had to offer. Other times the creepy factors of the anime are aptly nightmarish in presentation in the music: like a creature sitting in a corner watching with an intent eye. It’s a piercing sort of feeling and the music could capture that fear. And still there were times, that you could feel yourself on a world tour just sitting under an umbrella at a cafe in Paris for example, while watching the world go by and all from the nonsensical sounding lyrics to a very serious song. As many figures or paraphernalia I may collect of the series, the music would always be the one possession I’ll always hold closest to me. There’s no black and white here... only an amazing experience of complexities in sound and raw emotion that cannot be denied. The soundtrack plays like a beautiful dream that's meant to be filtered into your ears, settle in your mind and take residence in your heart. It's a soundtrack that will forever remain a timeless, classy masterpiece... even after the stars fade in the blue.